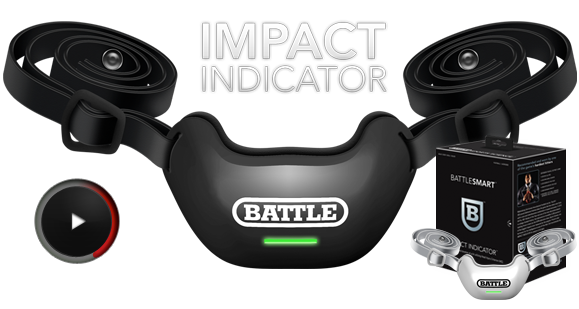 One of the newest products is due to hit the shelves August 1st, the Impact Indicator a real-time accelerometer implanted in a chin guard. This product has been worked on for years and developed as a cost-effective way to provide another “tool” to heighten the awareness about concussions. Not only that, this product is something that will help with the identification of possible concussive episodes that may otherwise go unnoticed due to a myriad of reasons (no self reporting, lack of awareness, or simply being not seen). Here at Battle Sports Science, we have been working on a solution to the concussion problem in sports for a number of years. As I stated earlier, when it comes to the brain, matters are quite complex. For example, there is no real-time electronic diagnostic tool for concussions, and predicting a concussion is not yet possible. It’s important to let you know our product does neither of these two things. The Impact Indicator isn’t a medical device. It’s a mechanical device created to indicate a certain impact over duration of time at levels where the possibility of a head injury is significantly elevated. No other product can, in real-time, and at a price point that’s affordable, identify hits that are more likely to result in injury. With the Impact Indicator, coaches, trainers and parents can identify players that need further evaluation, and that’s critical. If a head injury is detected, a player can be assessed quickly – maximizing treatment, recovery and preventing subsequent injury such as Second-Impact Syndrome. Why now? Youth and professional sports need help now. A new study shows that one in five NHL players who sustained a concussion during a shift in the regular season went back on the ice that same game. Professional teams have highly experienced trainers and doctors on the sidelines, and even they struggle to identify and treat these “invisible injuries.” Estimates show that only 40% of high school athletes today have access to a qualified trainer – meaning most of our children are playing with no trainers or doctors on the sidelines. Not to mention practices where a significant number of concussions still take place – and few eyes and resources are there for the players.We do not intend to change the spirit of the game in contact sports. We have field-tested the Indicator to ensure the least amount of “false positives” in order to minimize any disruption during play. At the same time, we have calibrated our software to read at a more conservative end of the Wayne State Head Injury Criterion (HIC) scale. We feel this is a safer position, and would rather over report than under report on possible brain injury. Please remember that concussions can occur at lower levels and our device does not indicate at those levels. The push to bring more certainty and more predictability to the concussion issue is ongoing. At Battle Sports Science, in conjunction with research and education, we are working hard to help better predict, understand and treat brain injuries. As a part of our commitment to sports safety, Battle Sports Science will donate 10% of all Impact Indicator profits to concussion education, research and prevention efforts. Thank you for your interest in the Impact Indicator. We hope it will help you and countless others battle hard and smart at the same time. Battle Sports Science is a “third-party” website as it relates to The Concussion Blog. Disclaimer: These 3rd party sites are not affiliated with The Concussion Blog. The Concussion Blog has no control over the content on this site. (This disclaimer also goes for all other linked sites).